Paleontology is the study of fossils—the remains of ancient life forms whose impressions were preserved in rock. Fossils have been used to support the existence of dragons, Noah’s Flood and other catastrophic events, and Darwin’s theory of evolution. Based on his study of fossil seashells, the ancient Greek philosopher Xenophanes argued that the dry land on which they were found was once under sea. Shen Kuo, an eleventh-century Chinese naturalist, postulated a theory of climate change based on finding petrified bamboo. The 1700s was a period in which fossils were first actively collected and classified. Toward the end of that century, the French naturalist and zoologist Georges Cuvier recognized that fossils were remnants of living forms from the past, and the fossil record was based on the sequence in which fossils built up in strata (sedimentary rock layers). Cuvier noted that the fossils in the older strata were more dissimilar to current life forms and while some species disappeared and became extinct, new ones appeared. In 1796, in one of the earliest papers in paleontology, Cuvier reported, based on living and fossil skeletal remains, that African and Indian elephants were different species and that the mastodon was even different from the others. He also concluded that large reptiles lived prior to mammals, based on the strata in which the fossils were found. Cuvier actively opposed pre-Darwinian theories of evolution, and consistent with Biblical teachings and the story of the Great Flood, he argued that a single catastrophic event destroyed life and was replaced by existing life forms. In his extremely successful and influential three-volumePrinciples of Geology (first published in 1830–1833), Charles Lyell, a Scottish lawyer-turned geologist, challenged this view and gained public acceptance of uniformitarianism, namely, that changes in the Earth occurred by natural, imperceptibly gradual processes. This concept had a profound impact on Charles Darwin, who collected scores of fossils during his five-year voyage on the Beagle and, after reading Lydell’s works, came to view evolution as being biological uniformitarianism, which occurred over generations but too slowly to be perceived. SEE ALSO: Reptiles (c. 320 Million BCE), Mammals (c. 200 Million BCE), Darwin and the Voyages of the Beagle (1831), Fossil Record and Evolution (1836), Darwin’s Theory of Natural Selection (1859). 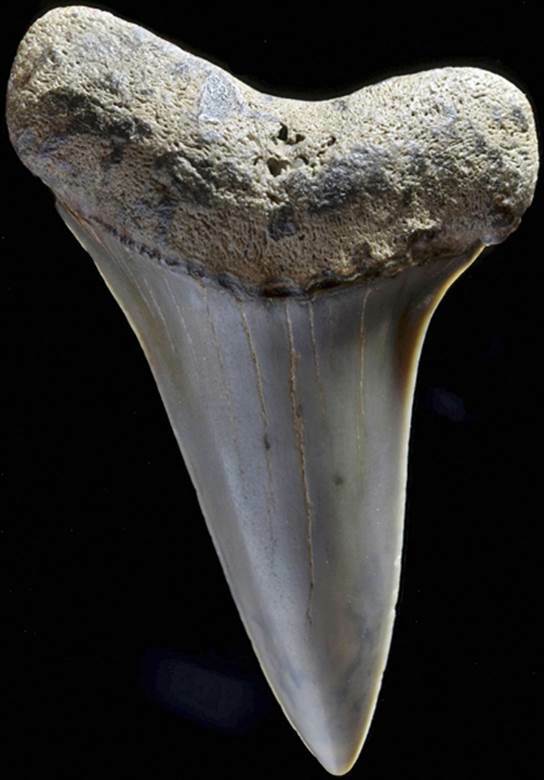 This fossilized tooth of a mako shark was washed from Miocene cliffs and found along the Potomac River in Westmoreland State Park in Virginia. The Miocene epoch dates from approximately 23 million to 5 million years ago.